Low level literacy doesn’t mean low level intelligence, and needn’t be a barrier to education and upskilling. Literacy and numeracy education graduates discussed this crucial topic at a Careerforce graduation event recently. 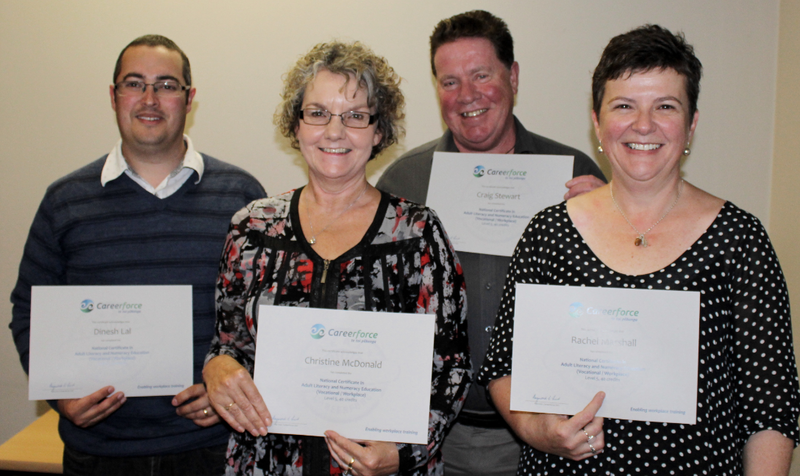 Educators and assessors came together to celebrate completing the National Certificate in Adult Literacy and Numeracy Education (NCALNE) Vocational/Workplace (NZQA Level 5, 40 credits). The Certificate was completed via distance learning with the support of the Careerforce NCALNE (Voc) Educator Hub. “Thirty four per cent of level 2 trainees in the health and wellbeing and cleaning sectors are assessed with low level literacy,” says Andrew Saunders, Manager Employer Services, Careerforce. This statistic highlights the importance of working to address this issue. Careerforce Literacy and Numeracy Advisor, Cushla Wilson facilitated the Educator Hub workshops and supported the group of eight trainees in the Christchurch Hub. Other hubs are working in Wellington and Auckland. “Employees who struggle with reading and writing usually build other literacy skills to compensate and may have excellent speaking and listening skills,” says Cushla. “Their ability to build relationships means they can learn by interacting with others. When it comes to the care plan – they’re not reading it or not reading it well, but they have other strategies that they’ve developed in their adult life. This could include asking a workmate to read it out for them or asking the supervisor if there are any changes in the care plan, to enable them to get the required information. “We’ve got a lot of really amazing people in our sectors, with literacy and numeracy learning needs, who are doing a great job. But text-based reporting formats, increased health and safety reporting, complex between-job travel and time recording and e-learning programmes, are all becoming more widespread in our workplaces. It’s important to address the literacy and numeracy demands that underpin these new ways of working,” Cushla adds. The purpose of the Adult Literacy and Numeracy Education qualification is to raise the abilities of workplace-based adult educators to enable them to further develop the literacy and numeracy skills of the staff taking part in a workplace training programme. Dinesh Lal, Nurse Educator, from Canterbury District Health Board (CDHB) said that the training has been really valuable. “I have better knowledge around what some of the learning needs of the individuals might be. Now I think ‘how can we vary our training to meet more of those needs instead of meeting just a select few?’ It’s given me a whole lot of different activities to incorporate into the teaching I do. “These people are not used to sitting down at a desk and learning that way. They’re used to being busy and doing things. I did a lot of clustering activities, giving them the information that they had to put together and make sense of. I got them up out of their chairs, talking with each other. It’s what they do. They’re not so used to writing everything down or learning that way. Many of the trainees taking part in workplace training programmes left school at an early age and haven’t got any form of qualification. Statistics show that overall 25 percent of the health and wellbeing workforce, supported by Careerforce, hold no qualification – compared with the 14% of New Zealand’s overall workforce. “When they’ve done the NZ Certificate, they think ‘actually I can do this, I’ve got skills and I can contribute. I’ve got knowledge that I can apply to my workplace and I can share what I know with others as well.’ I suppose its self-worth in a way, and a sense of belonging amongst the wider team. They may already have a lot of knowledge and skills, but now it’s recognised,” adds Dinesh. Colleen Naughton, Clinical Manager, from St John of God Hauora Trust (provider of disability, youth and social services) has been using elements of literacy and numeracy in her teaching tools for many years. “I’ve mainly done level 3 and 4 with Support Workers, Registered Nurses, Enrolled Nurses or Allied Health Professionals. But last year our organisation wanted to put the cleaning staff through a qualification. We wanted to make sure that everybody was using best practice guidelines. Rhonda Henderson works for Amida Training, a training umbrella for Access Homehealth Limited. “Over the last couple of years, I have been putting trainees through the level 2 Health and Wellbeing. Doing this course has really opened my eyes. “I already had a few skills that I tried to put together in my own way, but doing this course has actually brought it all together. Rhonda agrees, “Before I get to class now I see them one-on-one and make sure that they don’t have a literacy and numeracy problem before they get into the class. Who’s going to put up their hand and say ‘Oh I’ve got a literacy and numeracy problem.’? Having low level literacy doesn’t need to be a barrier to success at work for these individuals. New teaching methods and tools are available for people who educate these groups of trainees to help them with their understanding and confidence. For more information about how you can complete the National Certificate in Adult Literacy and Numeracy Education (Vocational/Workplace). (NZQA Level 5, 40 credits), contact Careerforce: www.careerforce.org.nz.